Download this FREE guide for setting goals for teenagers. The number one habit that all successful people have in common is the ability to set goals. Thank you! Click here to download now. 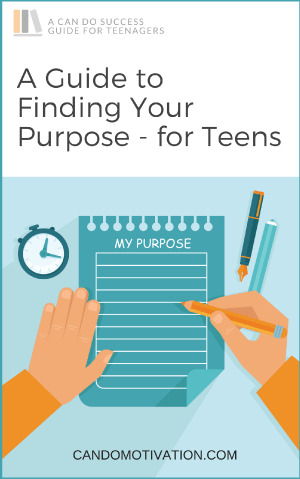 A carefully prepared step by step guide to help teenagers find their purpose. Success is the achievement of a goal (a purpose). If you don't have a purpose, how can you achieve a success. This guide will help you examine who you are now and help you write a short purpose statement - an essential guide to achieving success. Part of the Can Do Teenagers Success Guide Online Course, these guides are carefully structured worksheets on selected topics on preparing teenagers for success. Topics covered include - purpose, determination, success, hard work, goal setting, peer pressure, learning from failure, leadership, success habits, attitude, time management, positive thinking, courage and responsibility. Each guide comprises of a worksheet activity requiring about 30-45 minutes to complete.